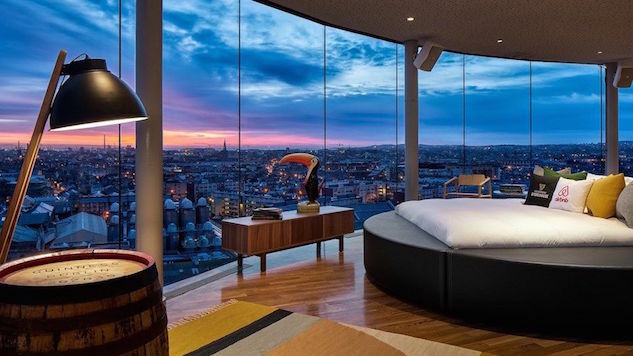 The Guinness Storehouse in Dublin, Ireland has partnered with Airbnb to award one lucky beer drinker the opportunity to stay the night in their world famous brewery. The competition is called “Night At,” and allows for one traveler and a guest of their choice to sleep in the Gravity Bar at Guinness. While there, guests will live in luxury with a 360-degree view of Dublin’s fantastic skyline. The bar will be turned into a loft-style apartment for the contest winner, including a pint-shaped bed, pool table and life-sized Jenga game. In addition, the room will be equipped with Guinness artifacts from their archives and a special tasting section (which comes with a private butler). And if all of that is not enough, there is a humongous telescope for guests to get a close-up view of the night sky over Dublin. Upon arrival, guests will be greeted by Domhnall Marnell, the brewery’s beer specialist, for a behind the scenes look of the St. James’s Gate Brewery where Guinness beer has been produced since 1759. Also included is a face to face experience with brewer Peter Simpson and a six-course dinner. If you are interested in applying, do it before submissions end on March 22. To apply, all contestants must do is explain what makes them biggest Guinness fan. The trip is redeemable by the winner on April 24.